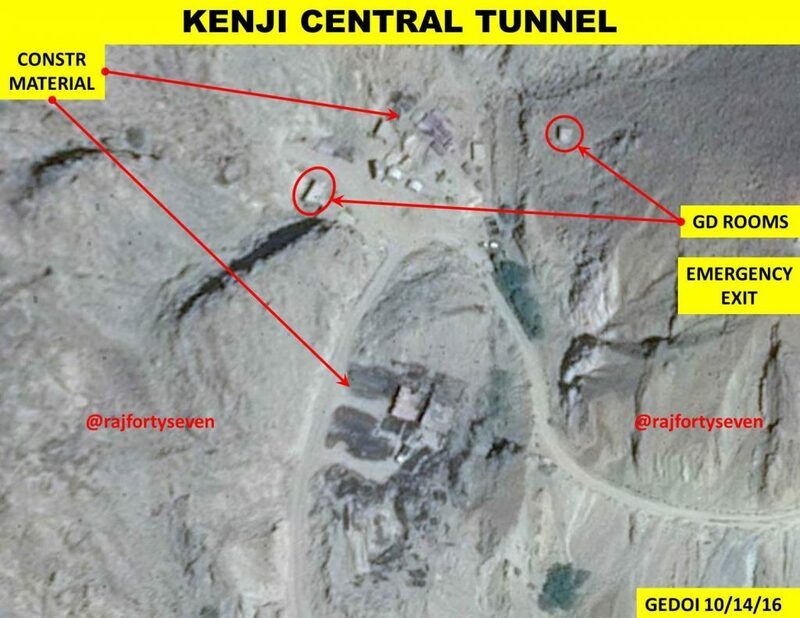 Two of these at Khuzdar and Kori have been detailed earlier and subsequently confirmed by geospatial information analyst Frank Pabian of the Washington-based Institute for Science and International Security. The third facility revealed now is in Kenji in the foothills of the Barugh mountains and is still under construction. It is expected to take another two years to be completed at the present pace of construction and no missiles are possibly deployed there yet. The facility can store 30-60 Shaheen-III missiles which have a range of 2,750 km and can pose a serious threat to most major Indian cities. The facility is at a distance of about 965 km from New Delhi, 1,100 km from Mumbai and 3,200 km from Port Blair. 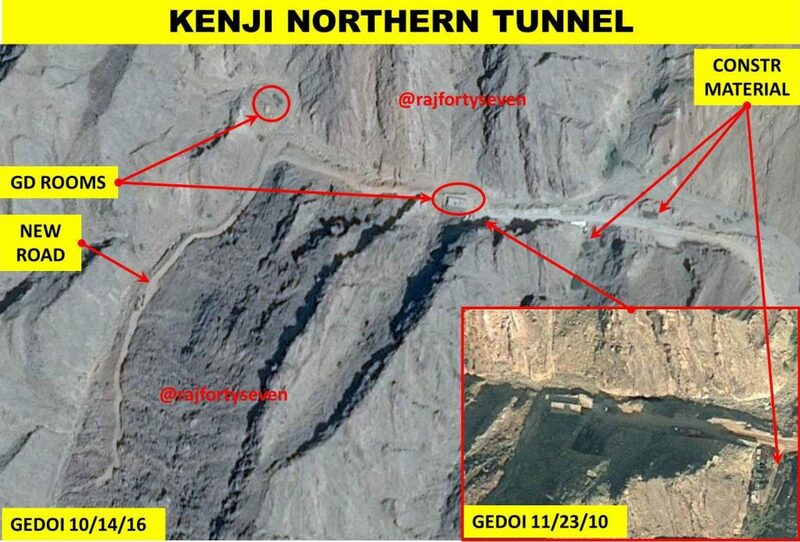 Located painstakingly through open source Google Earth satellite imagery dated 2004 through 2016, this nuclear weapons tunneled storage facility is in Qambar district, 80 km east of Khuzdar and the same distance west of Larkana. The exact location is 27 41 41N 67 26 01E and construction began in the first half of 2003. The facility has three main tunnels with double layered perimeter fence, support area with possible administrative office. The site may have mechanical transport (MT) garages, residential buildings and a religious place in future. The main area consists of three main tunnels with approximate 10 m wide entrances. The tunnels have been carved out of the mountains for more than 14 years, indicating large areas that must be prepared inside the mountain interconnecting each other. 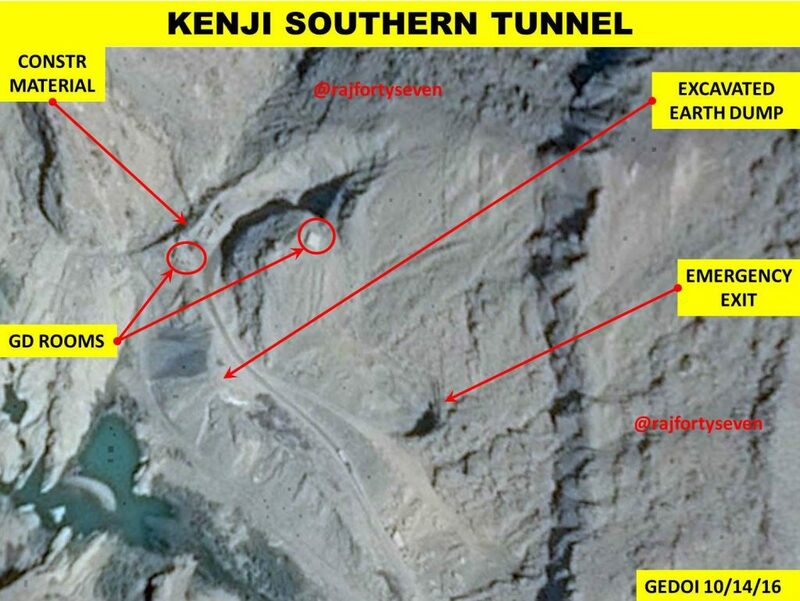 The height of entrance cutouts are approximately 15-25 m and width 20-25 m. The tunnels’ entrances would most likely be strengthened by cement concrete and compressed earth just like other tunneled facilities observed in Pakistan. There is a new road being constructed from the northern portal towards the west of the complex. This possibly will lead to yet another tunnel entrance in future. The southern portal has a smaller opening of 5m width located very close to it. This probably is an emergency exit in case of any unforeseen eventuality. One of the entrances has construction material dumped near it in the latest imagery. These materials look like iron bars used in heavy construction projects especially for intertwining in reinforced concrete. Similar construction material was observed near the northern entrance earlier which now has been removed, suggesting its use in internal construction. This suggests that construction of the northern portal has possibly been completed and construction of the central portal is in full swing. Latest imagery also shows that the administrative and support complex presently consists of a possible administrative office and a likely high-bay garage. The complex also has a 9 m x 9 m building tucked into the mountain side, probably being used an explosive store. There are two small buildings which possibly may be makeshift mosques. Towards the south of this complex there is a cement mixing plant and two more barracks probably used as residential accommodation for the construction staff and a motor transport garage. 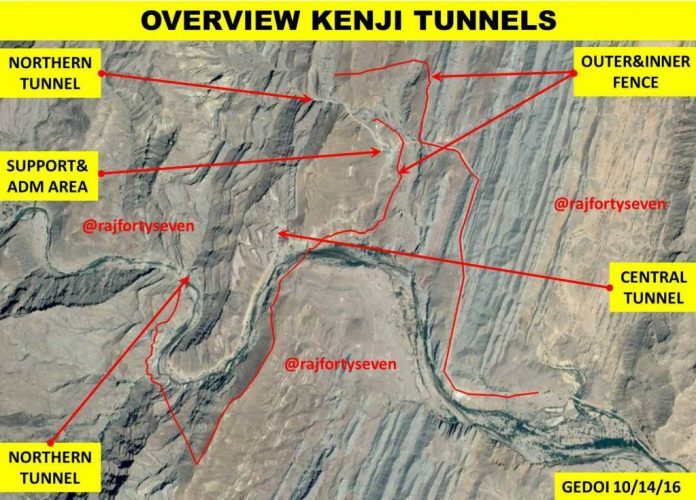 The excavated earth from these four tunnels is being very systematically disposed at various places including the stream flowing nearby. The traces are being carefully camouflaged, by fast growing trees and shrubs, to avoid detection. 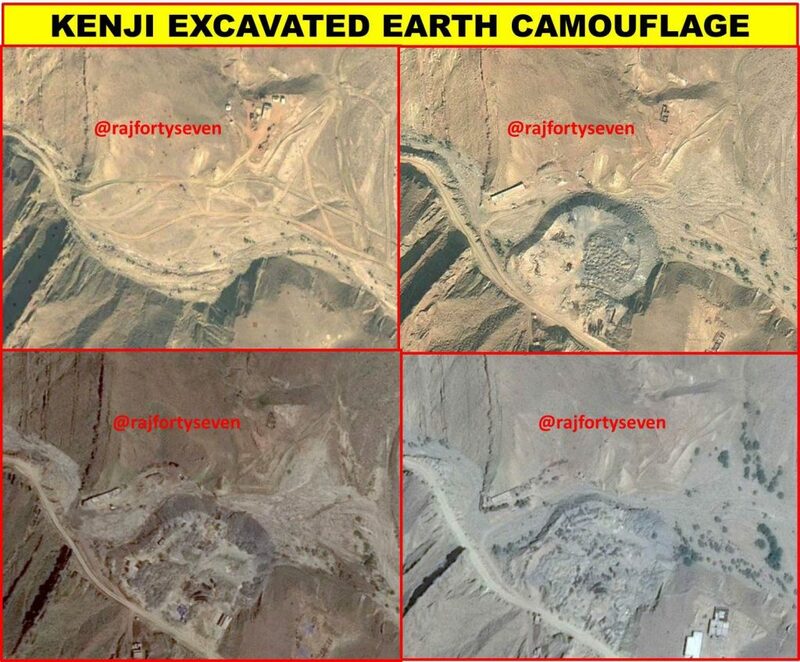 However, nothing can be hidden from satellite imagery. The rough calculations of internal sizes are still possible from detected disposal dumps. The approximate internal area would be 150,000 Cu m. For a layman it would be a tunnel of 10 m x 10 m size for a distance of 1.5 km. The road within the inner fence is being lined with fast growing trees on both sides for camouflaging future vehicular movements. 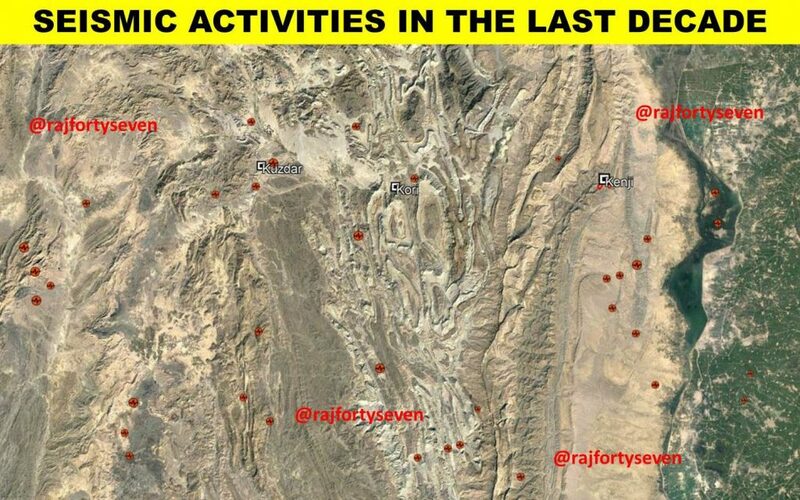 This entire area is prone to high seismic activities which probably have not been factored into while selecting the sites. The recent seismic activity observed by the United States Geographic Survey (USGS) when plotted vividly displays the imminent dangers to these facilities as indicated in image below. A two layered perimeter security has been provided to this facility. Both outer layers are probably barbed wire fences. No watch towers are seen yet along the fences. Obviously these fences are still under construction. The third layer of security and access control is being provided by a gas field, about 9.5 km from the site, being manned by FWO. The three portal entrances are vastly separated from each other by more than 400 m-1000 m to avoid bombing in one dive. 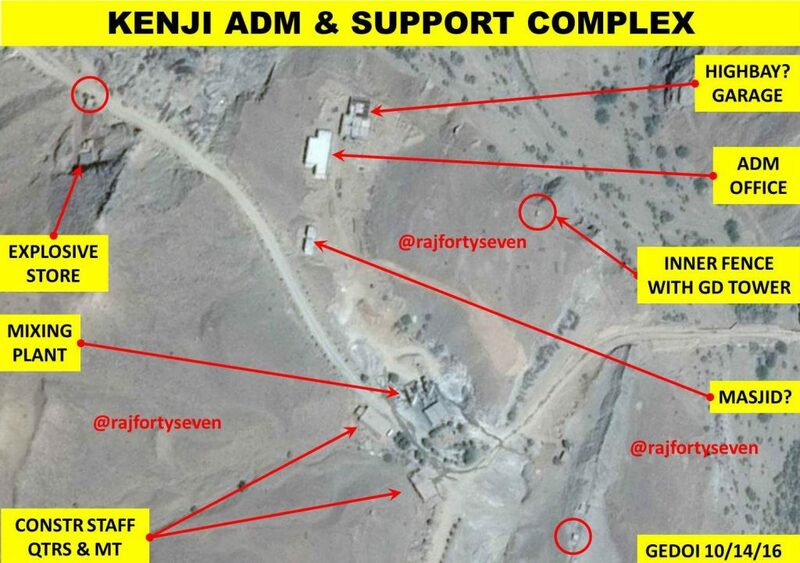 The facility has not yet been provided with any air defence cover. It has a single entry and exit road. Access control facilities are observed only at the support area and tunnel entrances. This tunneled facility makes targeting of mobile launcher units difficult if not impossible. The construction of tunnel entrances in different directions would preclude a single sortie air attack.